Kanye West's tweet storm is not over. On Friday, he went hard at Drake with an epic rant in over 125 tweets. Today, he's tweeting more about mental health and hitting out at celebs who took advantage of the situation to take shots at him starting with Ariana Grande. 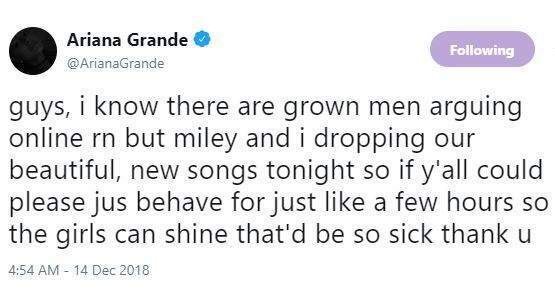 When Kanye West started his tweetstorm two nights ago, Ariana Grande who had just dropped a song with Miley Cyrus tweeted, 'guys, i know there are grown men arguing online right now but Miley and i dropping our beautiful, new songs tonight so if y'all could please just behave for just like a few hours so the girls can shine that'd be so sick thank you'. 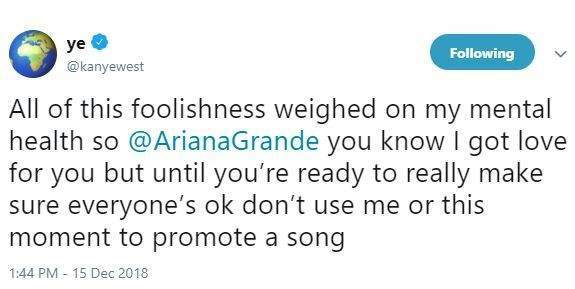 Kanye West in his response this afternoon said, 'all of this foolishness weighed on my mental health so Ariana Grande you know I got love for you but until you're ready to really make sure everyone's ok don't use me or this moment to promote a song'.